The demonstrations mark the beginning of a three-day strike by African nationals in Israel who want to be recognized as refugees. 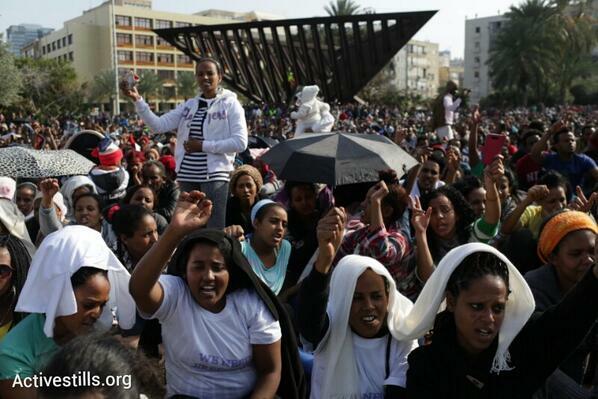 Tens of thousands of African migrants marched in silence to Tel Aviv's Rabin Square Sunday. The group members are demanding that Israel recognize their asylum requests and stop jailing them at detention facilities. It was the biggest protest to date by asylum-seekers in Israel, and comes on the heels of several weeks of protests throughout the country. Israel recently passed anti-infiltration laws, which allows it to jail asylum-seekers for one year, and then keep them detained indefinitely in the newly built Holot internment camp, which allows them to leave in the daytime, but return each night. The first asylum-seekers who were brought to the Holot facility carried out acts of civil disobedience, which included marching through the snow to the Israeli parliament in Jerusalem. They were all arrested and returned to Holot. Israeli immigration authorities have also begun conducting sweeping arrest campaigns, where they patrol areas of south Tel Aviv looking for anyone without valid documents. 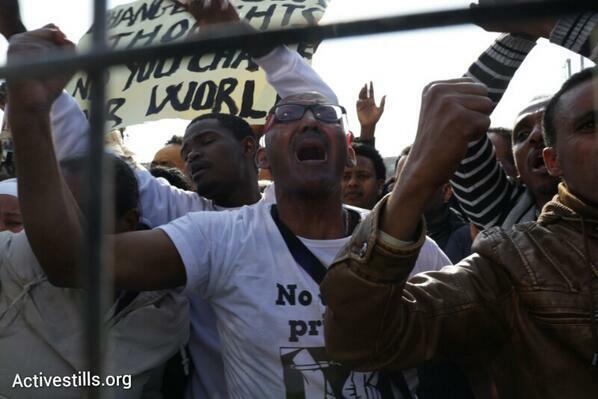 "It feels like they are hunting us," said Obeida Omani, a 27-year-old Eritrean. "At least let them review our cases and decide if we are refugees before they throw us in prisons," said Omani. Israel's current policy is to not process asylum claims from Eritrean or Sudanese nationals. "We just want the chance to work, to make a living, until we can return to our home country," said Omani. "We thought the Jewish people would understand what this is to be a refugee. We thought they would be more sympathetic." Last year, Israel began "voluntary deportations" of South Sudanese and Eritrean nationals. Those deported were given money and a free plane ticket if they agreed to leave Israel. Human rights groups, however, have called the deportations "unethical." Amnesty International has documented cases of those who were deported facing persecution in their home countries. Last week, at least five people, including one child, who were deported from Israel to South Sudan were killed in clashes there. Israeli officials have not yet responded to the demands of the protesters.